Have fun! Reading together should never be a chore. Take every chance you have to read with your children, tell and talk about stories, recite nursery rhymes, and sing songs. Expose your children to a variety of different types of stories and vocabulary. It is okay to read the same book again and again, as all children have their favorites, but when you have the opportunity, introduce new stories so that your child has a chance to experience and hear as many new words and concepts as possible. 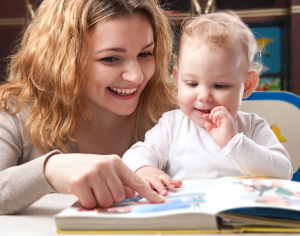 Children learn best when they are in a good mood, so read with your child when the experience will be the most pleasurable for both of you.